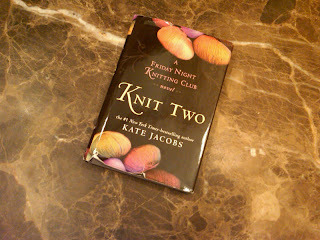 It's been almost three years since I read The Friday Night Knitting Club (Friday Night Knitting Club Novels) by Kate Jacobs. I loved it. I'm a sucker for a novel about relationships. The women in the knitting club all had their own quirks, problems and hang-ups but they all came together and formed this tight knit (sorry, had to do it) family. Well, I picked up Knit Two (Friday Night Knitting Club, No 2) months ago and it's been sitting on my bedside table unopened ever since. I think I even let my sister borrow it before I read it...that never happens. I'm not sure what kept me from reading it because I loved the first one and I'm one of those people who love sequels or series when it comes to books. I always want to know what happens to the characters AFTER the book ends and Knit Two does this wonderfully. Well, I threw Knit Two in my carry on before I headed out for a business trip to San Antonio recently. I like quick, easy reads for the plane. I really like to be able to finish by the time I step off the plane at my destination. As I got deeper into the book and caught up with what Dakota, Anita, Peri, KC, Lacie, Darwin and Catherine had been up to in the five years since the first book, I quickly remembered something very important about when I read the first book. I cried...no, I bawled my eyes out. Now, this isn't a bad thing. I appreciate an author and a book that makes me cry. So, I finished the book about halfway through my second flight today and teared up a time or two - nothing like I did with the first one though. Like I said before, I enjoyed catching up with the ladies in the Club and am planning to pick up the Christmas-themed novel Knit the Season: A Friday Night Knitting Club Novel soon ; but I definitely enjoyed the first book more. I won't give away the plot. Just know that Dakota is now a college student; Darwin is pregnant; Peri is running the shop and a growing handbag business; KC is a lawyer; Lacie is a mom and a music video director; Anita and Marty are happy but not married; and Catherine runs her own antique/wine shop. Half the club heads to Italy. Some find love. Some lose it. They all deal with life's ups and downs. They all honor Georgia in some way. Reading it totally makes me want to take up knitting...again. I started to learn BEFORE I read the first book but after making a major mistake on my scarf at the beginning of the aforementioned trip to Greece, I put away my needles. Maybe I'll pick them back up...or maybe I'll just go out and get the third novel in the series! I'm going to have to check this one out on my new kindle that The Farmer surprised me with on Christmas. Ooooohhhh.. I have that first book around here somewhere, and I don't think I finished it. I might have even given it to my mom (who LOVES to knit!). I'm going to have to check around and see where it is! Thanks for the brain jog!